When most people think of nutrition, visions of nutrient daily values and calorie counts come into their heads. However, when Traditional Chinese Medicine (TCM) was started thousands of years ago, information about the molecules that make up food wasn't available. Chinese diet therapy instead focused on the energetics of food, categorizing food with the same methodology as herbal medicine. One such category - the one that's the easiest to understand - is that of "property" or inherent temperature. A man takes a ghost pepper from the refrigerator. Because the pepper feels cold to the touch, he would expect it to cool him off. As soon as he bites into it, though, his face turns bright red, he breaks into a sweat, and has a very strong urge for water. A woman has a picnic on a hot summer's day. She takes a slice of watermelon that has been sitting out in the sun, finding it warm to the touch. When she bites into it, though, she feels refreshed, hydrated, and even a bit cooler. Can you see how the physically cold ghost pepper was still intrinsically hot and the physically hot watermelon was still intrinsically cold? 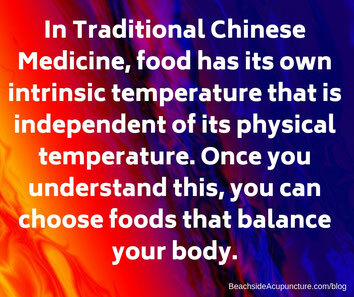 Once you understand this concept, you can actively choose foods that will balance your internal temperature. 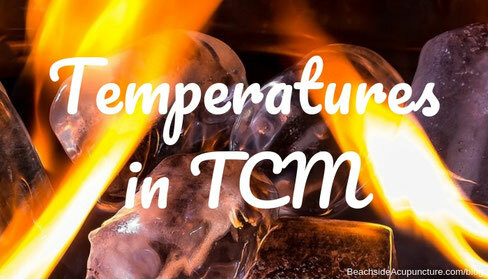 TCM is all about common sense and logic. If you tend to run cold, you'll more than likely feel the best eating warming foods and avoiding cold foods. If you tend to run hot, then you'll probably need the opposite. While some foods have temperatures that are more difficult to guess, keep it simple and start with foods that are obvious, for instance by avoiding spicy foods if you overheat easily or are prone to hot flashes. Don't forget beverages here either! Alcohol and coffee tend to be dehydrating and can therefore make someone who tends to sweat a lot feel worse. Not sure where you stand in this hot-cold spectrum? Your Licensed Acupuncturist can give you a better idea based on your symptoms and physical findings like tongue diagnosis (in most cases, red tongue = heat, pale tongue = cold). If you truly are evenly balanced, then we recommend eating with the seasons as nature provides exactly what we need when we need it, for instance by giving us cooling fruits like citrus in the summer. Otherwise, follow the general recommendations given in our Diet Therapy Starter Sheet - sign up for our newsletter to get it sent to you for free - and eat organic as much as possible to give yourself the best nutritional foundation possible. Your body will thank you!